The arts program for hundreds of young boys and girls that weekly attend the Gene Slay’s Boys’ (& now Girls) Club of St. Louis got a huge boost from Stagehands Local 6: an initial donation of $5,000 and a pledge of $5,000 each for the next two years, a total $15,000 commitment from the union. 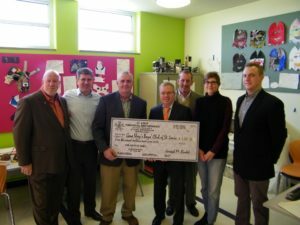 “Realizing how effective the club is, and the need for more arts to be introduced to young people, Local 6 decided to focus a single annual donation to help promote the arts instead of making a lot of small donations to many different kinds of groups,” said Local 6 Business Manager Joe Rudd said in presenting the first $5,000 installment. “You’ve given our kids a unique opportunity they’ve never had,” said Executive Director Prescott Benson in thanking the union for their unique commitment to the club and its service to St. Louis’ youth. The Labor Movement is a staunch supporter of the club, both financially in terms of supporting its annual fund-raising golf tournament and with services to help the club. For example, Operating Engineers Local 513 last year provided manpower and equipment to help build a community playground on the club’s grounds. Other unions over the years have also donated manpower for specific projects and participate in the club’s annual golf tournament major fundraiser. This, however, is the first time a union has made such a long-term commitment. Tickets: They hope to partner with local theatres and the business community to help provide tickets to live theatre productions for kids, many of whom have never seen a live stage performance. Backstage tours: Through the business partnerships that Local 6 has established, they would like to conduct backstage tours of theatres and/or event spaces, to give interested young people a more thorough understanding of show business and how exciting a career as a stagehand can be, building sets, rigging shows, etc. Volunteers: Have volunteer members come into the art classes to share with the kids their passion for the arts and how to build a sustainable career that fosters their love of the arts. Gene Slay’s Boys’ (& now Girls) Club of St. Louis, located in the Soulard neighborhood, has and continues to improve the lives of at-risk, marginalized, and underserved youth by equipping them with the skills they need to make good choices and become successful adults. The club’s professional and licensed staff and educators, through academics, athletics, individual enrichment and personal tutoring make permanent and positive changes in the lives of the children they serve. With a rich history in the St. Louis region within the arts and entertainment, education, trade show, and convention industries that reaches back more than a century, Stagehands Local 6 (an affiliate of the International Alliance of Theatrical Stage Employees International Union) is a trusted provider of technical expertise and skilled labor in all aspects of scenic, lighting, audio, video, properties, and rigging. Whether it’s a Broadway show, a corporate meeting, concert, or trade show, indoors or out, customers and potential customers turn to Local 6 to help stage their event. Local 6 members are trained and dedicated to the practice of the safest and best industry standards, Rudd stressed.